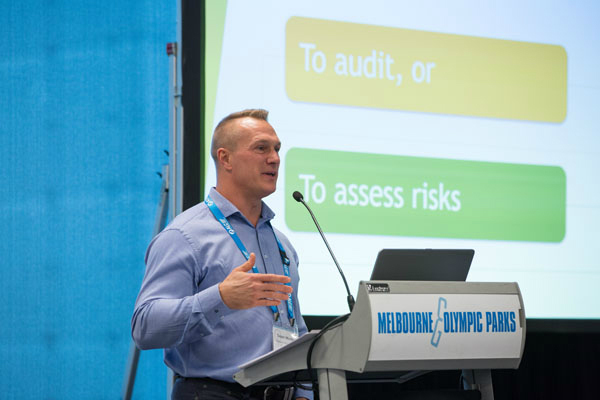 Our Director and Principal Consultant, Sean Minto recently had the pleasure of attending and presenting at the 2018 ALC and ATA Supply Chain Safety and Compliance Summit at Melbourne Park Function Centre on 5-6 September 2018. The Australian Logistics Council (ALC) and Australian Trucking Association (ATA) are the peak industry bodies representing supply chain parties and transport operators respectively. The Summit provided exclusive insights into the industry-wide Master Code for heavy vehicle safety, which ALC and the ATA have worked together to develop over the last year, of which Sean is the technical writer. In this capacity Sean participated in a panel session titled ‘Compliance with the Master Code under the new CoR provisions’. The session explored how heavy vehicle operators can use the Master Code to ensure compliance with Chain of Responsibility (CoR) and the Heavy Vehicle National Law (HVNL). The ALC / ATA Master Code will be the go-to resource for ensuring compliance with CoR and the HVNL. On day 2 of the summit, Sean facilitated a workshop titled ‘The Master Code – Putting theory into practice’. During this workshop Sean took participants through a step by step process to identify hazards and assess the risks associated with your transport activities based on your CoR role. Sean shared insights from how he has assisted clients put theory in practice. A copy of Sean’s workshop presentation can be accessed below. If you would like to put your questions directly to one of the authors of the Master Code, so you can better understand how it can help you deliver enhanced safety in your own operations, please feel free to contact Sean. What Is The Master Code? To help all supply chain participants better understand and meet these expanded obligations, the Australian Logistics Council and the Australian Trucking Association have partnered to develop a Registered Industry Code of Practice (commonly known as the Master Code) for heavy vehicle safety. The Master Code will translate the requirements of the HVNL into a framework of known risk types, risk assessment information, and risk controls which parties with CoR obligations will be able to implement in their operations. It will help to provide clarity for industry, for investigators, and for courts regarding the known risks around road transport operations, and the best practice response measures that may be installed to minimise those risks. The contents of the Master Code are the result of an extensive program of industry consultation and engagement, ensuring that the Code reflects the need of industry participants. How Will The Master Code Work? The Master Code will translate the requirements of the HVNL into a framework of known risk types, risk assessment information, and risk controls for parties with CoR obligations to implement in their operations. Supply Chain Safety Excellence is one of Sydney’s leading Supply Chain & Logistics WHS Consultants. Sean Minto, director and principal consultant, exemplifies safety leadership and can make a difference to your business. Get in touch with Sean.